At Glemseck 101 in Germany this weekend, Indian Fans can look forward to an exclusive premiere: LOUIS, an online motorcycle store, will present a new Project Bike based on an Indian Chief Vintage. This power-packed beast has been especially built by the team at LOUIS and will be revealed by Mai-Lin Senf, a stunt girl and model from Hamburg, who will be taking up her position on the start line of the sprint races at Glemseck 101 on the new bike. Katja Poensgen will also be racing in the Essenza sprint races astride Miracle Mike, the Indian Scout modified by the Young Guns Speed Shop. Her aim is to pick up her second win in succession in the now famous sprint series and secure the prestigious championship title. The former Grand Prix rider has already blown away the competition in the first Essenza sprint race of the year in Monthléry, France as well as in the Punks Peak sprint races at Wheels & Waves. Nik Herr and Fabian Witzig from the Young Guns Speed Shop dedicated over 700 hours into transforming an Indian Scout into a sprint and show bike. 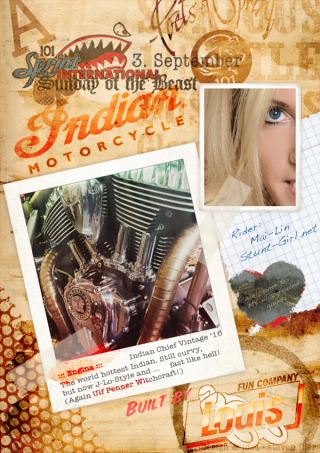 In the course of the very time-consuming project, which was launched at the beginning of 2017, the Swiss two-man team could always rely on the official support of Indian Motorcycle. In addition, Öhlins, Brembo, Akrapovic, Wizards of NOS, LSL Motorradtechnik GmbH, Metzeler Motorcyle Tyres and Motogadget contributed parts and products. The Young Guns designed and rebuilt the Indian Scout solely in their workshop in Rapperswil, south of Zürich. Particular striking features include a NOS system and unique custom parts, such as the fuel tank. The bike celebrated its debut at the Art & Wheels in Basel in the middle of 2017. Specifically for the Essenza races, the Young Guns decided to fine-tune the modified Scout once again. After various modifications to optimise the bike’s performance, the young Swiss lads were able to take a further 48 kilograms off the 245-kilogram lightweight Scout. For the engine tuning, the Young Guns went to Polaris Swissauto (who created the big 750 cc V-twin for the Scout FTR7500. The resulting engine tuning created a powerful 185 PS, which gives Miracle Mike enormous reserves of power. The name of the bike, by the way, pays homage to a famous American chicken that, despite having no head, demonstrated tremendous staying power and lived for a further 18 months after it had its head chopped off. Glemseck 101 takes place from the 1st to the 3rd September near Stuttgart and the Essenza sprint races take place on the Saturday.